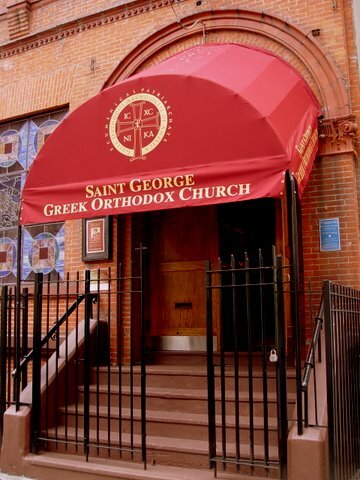 Welcome to Saint George Church! “Faith is collaboration: thinking together, praying together, acting together. The Church is not the place of my prayer but of our prayer. We hope you will join us on Sundays and to participate in our various programs as you are able. Visit us online to learn about our church and our various programs. Sign up for our weekly bulletin and become a supporting member at www.SaintGeorgeNYC.org. Today we welcome Cassandra to the chanters' stand in John's absence. Cassandra will be assited by Emilee, who is now with us on a regular basis. Serving Orthros and Divine Liturgy today will be Fr Constantine Ursache, from the Cathedral of Saint Paul in Hempstead. VIEW THE COMPLETE MATINS SERVICE FOR TODAY IN ENGLISH & GREEK HERE. Visit us on our web site and on facebook. "I was hungry and you fed me...."
Thank you to all that help and support this ministry. On March, 15, 1965, Archbishop Iakovos joined Martin Luther King, Jr. in a historic civil rights march. Prior to the march, a memorial service was held for Rev. James Reeb, a white Unitarian minister who had been beaten to death by the Ku Klux Klan a few days earlier, for his commitment to improving housing in poor, black neighborhoods. Archbishop Iakovos’ words at the memorial follow. I came to this memorial service because I believe this is an appropriate occasion not only to dedicate myself as well as our Greek Orthodox communicants to the noble cause for which our friend, the Reverend James Reeb, gave his life; but also in order to show our willingness to continue this fight against prejudice, bias, and persecution. In this God-given cause, I feel sure that I have the full and understanding support of our Greek Orthodox faithful of America. For our Greek Orthodox Church and our people fully understand from our heritage and our tradition such sacrificial involvements. Our Church has never hesitated to fight, when it felt it must, for the rights of mankind; and many of our Churchmen have been in the forefront of these battles time and again….The ways of God are not always revealed to us, but certainly His choice of this dedicated minister to be the victim of racial hatred and the hero of this struggle to gain unalienable constitutional rights for those American brethren of ours who are denied them, and to die, so to speak, on this battlefield for human dignity and equality, was not accidental or haphazard. Let us seek out in this tragedy a divine lesson for all of us. The Reverend Reeb felt he could not be outside the arena of this bitter struggle, and we, too, must feel that we cannot. Let his martyrdom be an inspiration and a reminder to us that there are times when we must risk everything, including life itself, for those basic American ideals of freedom, justice, and equality, without which this land cannot survive. Our hope and prayer, then, is that we may be given strength to let God know by our acts and deeds, and not only by our words, that like the late Reverend James Reeb, we, too, are the espousers and the fighters in a struggle for which we must be prepared to risk our all. HOW FINAL WISHES ARE COMMUNICATED: It is critical that you make your wishes and plans known to your loved ones. Our world today requires that many of these wishes be documented in a will or trust or a living will. A living will and burial instructions can be prepared so there is no confusion at a time when it is easy to overlook important Orthodox traditions when stress and emotions are running high. The Stewardship Ministries of the Greek Orthodox Archdiocese has prepared an Orthodox Living Will that can be filled in and reviewed by your family, doctor and legal advisor. It is important, and we urge you to seek competent legal and financial advice. Please contact Stewardship Ministries (stewardship@goarch.org) for a copy of the Orthodox Living Will. STEWARDSHIP OF FAMILY: Throughout our lives and the roles we assume within the family, we are stewards of the love, authority, trust and respect that exist among members of the family. Unlike material possessions, these are not diminished by use. But if mishandled, they can be lost. Love, authority, trust and respect require the most diligent stewardship, because once they are lost, they are most difficult to recover. MEMORIAL SERVICES Prayer for the dead is seen by Orthodox Christians as an essential component of our faith in Jesus Christ. Praying for those who have died is not merely an expression of mourning, it is a proclamation that Christ has risen from the dead and that, in His love, even death cannot separate us from one another! Forty days after the death of a loved one (or on the Sunday nearest to the 40 days), it is the custom of our Church to celebrate a prayer service in remembrance of the deceased known in English as a Memorial Service. In this service we ask God to “grant rest” to the deceased “in the bosom of Abraham” (Luke 16:22-23) and to place him/her “in a place of light, a place of happiness, a place of refreshment, where there is no pain, no sorrow and no suffering” (Revelation 21:4) as we did during the funeral service. We are Stewards of the Gospel: We are called to guard the Gospel message, but not to hoard it. We are instructed not to hide our light under a bushel. As we share the voice of Christ, the message we share is one of hope, truth, grace, divine power, life and invitation. In this busy, ever-changing world, His voice of wisdom is needed to guide us in discerning what is good, what is true and what will bring us closer to Him and to one another. Our mission is to bring together professional members & friends of St George Church to form stronger friendships through events & activities. We accomplish our mission through Laughing, Learning and Giving, alternating between social, philanthropic and spiritual activities. Questions or Ideas? Contact Marissa at marissapallis@gmail.com to be added to our e-list. WINE FOR HOLY COMMUNION If you would like to offer wine to be used for the preparation of Holy Communion at Saint George Church, you are welcome to do so. The sweet wines that we use for Holy Communion are: Mavrodaphne, Commondaria and Nama Byzantino. SUNDAY PARKING: is available for $10 at ICON Parking on 54th St just east of 8th Ave. Bring your ticket to the candle stand to be validated. Effective from 8:00 AM-2:00 PM after which regular rates will apply. Stewardship is what a person does after saying “I believe…” as proof of that belief. to set up regular or 1-time stewardship contributions to St. George Church. The Holy Church has a sacred obligation to uphold and abide by the spiritual guidelines which have been formulated over the ages. One of these guidelines dictates that Wednesdays and Fridays are to be observed as days of fasting, in some cases that includes Saturdays and Sundays. Therefore, weddings are prohibited on such days. In order to avoid confusion and conflict, before you reserve a reception hall you need to check with the church if that day is indeed a day when weddings are allowed. Prokeimenon. Plagal Second Mode. Psalm 27.9,1. Verse: To you, O Lord, I have cried, O my God. The reading is from St. Paul's Letter to the Galatians 6:11-18. Today, the day following the Nativity of the most holy Theotokos, we celebrate the synaxis of Saints Joachim and Anna, honouring them as her parents. Saint Severian, a senator from Sebastia, was both an illustrious man of wealth and a fearless Christian. Because he encouraged the holy Forty Martyrs of Sebastia to stand fast in their confession, he was given over to terrible torments, and received his own crown during the reign of Licinius and Lysius the Duke, about the year 315. These Martyrs, sisters according to the flesh, were from Bithynia. They lived in virginity on a mountain near the Pythian hot springs of Bithynia, devoting themselves to asceticism and prayer. Betrayed to the local governor, Fronto, they were subjected to frightful tortures, and so gave up their holy souls into the hands of God. They contested for the Faith during the reign of Maximian, in the year 304. Thy Nativity, O Theotokos, hath procliamed joy to the whole world; for from thee hath dawned the Sun of Righteousness, Christ our God, annulling the curse and bestowing the blessing, abolishing death and granting us life everlasting. As we celebrate the memory of Thy righteous ancestors, O Lord, through them we beseech Thee to save our souls. In your holy birth, Immaculate One, Joachim and Anna were rid of the shame of childlessness; Adam and Eve of the corruption of death. And so your people, free of the guilt of their sins, celebrate crying: "The barren one gives birth to the Theotokos, who nourishes our life."